INMANTEC, a premier business school at Ghaziabad, is moving ahead full throttle in pursuit of excellence. 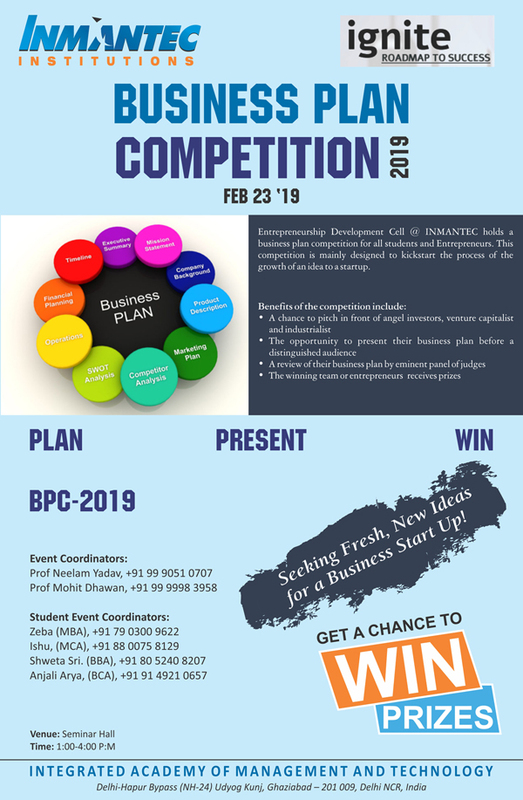 In our endeavor to let the management and IT students explore their hidden managerial capabilities, we are organizing Business Plan Presentation Competition on February 23, 2019 at Inmantec campus. Today the learning is not only confined to mere books; the students are rather required to develop skills of lateral thinking, to innovate the workable solutions to various business problems. INMANTEC is inviting students from NCR to participate in this competition & unfold and demonstrate to the world what all they have learned so far, and they are capable of setting new heights in emerging knowledge economy and leadership. Assessment Criteria of BPC 2019. For any further information please feel free to get in touch with Ms. Neelam Yadav and Mr. Mohit Dhawan on +91-9990510707,9999983958 or e-mail: ude.cetnamninull@vaday.maleen.